YAHOOO! It is Wednesday! AND every Wednesday is like CHRISTMAS on the Creative Scrapbooker Magazine blog! YA!!! This week we have partnered up with the wonderful gals from The Paper & Ink Boutique! They are giving away the VERY HOT and TRENDY Traveler’s Notebook! Here is the prize package you will win featuring Echo Park Paper Co.!!!!! HOW AWESOME IS THIS! You have until Friday, Nov 30th at midnight to enter to win. Done! Fingers crossed, I love buffalo plaid. wow such great products.. and great store as well…. love the magazine as well… done. Done ✅! 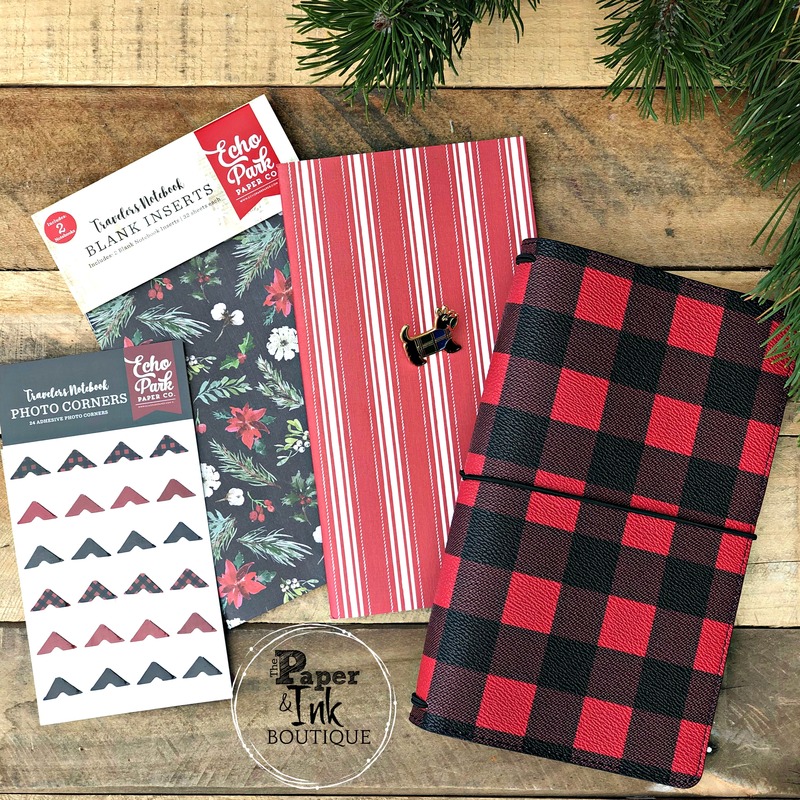 I love the red & black plaid journal! It makes me think of many childhood memories of wearing my warm plaid shirt while sailing, fishing, hiking and camping! Done!! What a great prize give away! What a great prize pack to take along on your next trip! I love both of the covers but definitely am partial to the scotty dog ! Great prize to win. DONE. Done. I abosolutely LOVE the Paper and Ink Boutique!!! Done thank you for sponsoring with paper and ink such an awesome giveaway from echo park! Love it! What a wonderful giveaway! I just love that buffalo plaid. Thanks for a chance to win! DONE! With a comment of appreciation and thank you CSM for another fun Why Not Win Wed! DONE. I need this in my life!! lol Hubby just retired and I’m down to one day a week, so we are going to travel as much as we can!! Thanks for the giveaway. Done! Thanks for this generous gift. Buffalo plaid is Xmas 2018! Love love love thank you paperand Ink and CSM! DONE! I love this notebook! Oh how awesome is this?!! Thank you CSM for teaming up with the paper and ink boutique to win this amazing travellers notebook. Plus it’s plaid – love! Done….. Thanks for the opportunity. I am a travellers journal junkie! Love these and especially the plaid! Done!!! Would love this! Thank you! I just started using the TN last year and I like them. DONE! Love that Buffalo Plaid!! I followed – Done! Gorgeous collection – love the designs! DONE!! Thank you for this lovely prize package. It’s always good to journal! Great give away! Thanks for the opportunity to win! Done and thanks for the opportunity! Done. Thanks for the chance to win! I love Travlers Notebooks! I’m new to all this TN trend – would love to this beautiful notebook. Love my CSM every 3 with scrapping and stamping ideas! Great giveaway for travelers like ME!!!! Done! Another paper store in Calgary is very exciting!! I have my fingers crossed to win! Thanks for the opportunity! I love travelers journals for everything. I make lists and take them everywhere I go. I would love a new shiny one to start the New Year off right. Done and thanks for the chance to win an awesome prize. Perfect gift for my granddaughter to use on her trip to Italy next Spring. Done. Love the new Paper and Ink store. DONE! Love the patterns. Thanks for the chance. Done! Would love to win…the buffalo check plaid is on-point! Thanks for the opportunity! I love the TN — soooo cute! Thank you for the chance to win. Merry Christmas. Loving that red and black plaid!! Done!!! Now I just have to travel again! I would love this travelers notebook! Follow on FB. I love the red and black check….so Canadian lumberjack! Done. Love using traveler notebooks when I travel!